A controversial proposal for elevating LA 1 to Port Fourchon, backed by Governor Jindal, has been drawing fire from the candidates seeking to replace him in the mansion. The plan would have used “leftover” funds from BP, unused because the coastal projects the RESTORE Act funded were completed under budget. “I would oppose that from this source of funds,” Scott Angelle said during a forum for the governor candidates earlier this week. But when the Coastal Protection and Restoration Authority met Wednesday, chairman Chip Kline announced that a compromise had been reached – to use GOMESA money instead of BP funds. “Up to 10-percent of the Gulf of Mexico Energy Security Act revenues we will begin to receive in 2017 to be spent on coastal infrastructure projects that are directly impacted by coastal wetland loss,” Kline said of the modified policy proposal. 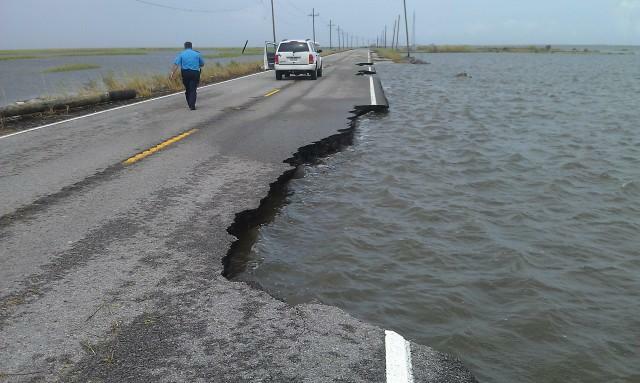 Some coastal and environmental groups and backers of the Highway One project supported the compromise, which Kline said was allowable under both the federal GOMESA language and Louisiana’s constitutional amendments dedicating GOMESA funding to coastal restoration. Steve Procopio with the Public Affairs Research Council urged caution. “Congratulations on jumping out of the frying pan. It remains to be seen on where you’re going to end up, though. I do want to caution you about saying because it’s legal, it’s okay,” Procopio said. And it’s precisely the sort of maneuver Jay Dardenne had warned against during the earlier gubernatorial forum. Democratic candidate for governor John Bel Edwards sees it as an absolute mistake. But Angelle, who objected to using the RESTORE Act BP money, left the door open for using GOMESA money to elevate LA 1. “Highway One actually helps us to gain more revenue from the federal offshore area, as so much of the money comes from that area,” Angelle stated. Angelle served as Governor Jindal’s legislative liason for the past two sessions. David Vitter did not attend the forum where the LA 1 proposal was discussed. More than a few political experts have voiced dismay over apparent voter apathy as we head into Saturday’s primary election. Bernie Pinsonat of Southern Media and Opinion Research addressed the Baton Rouge Press Club Monday, saying that’s because the budget problem – big as it is – is nothing new. Lawmakers have managed to avoid implementing the doomsday scenarios, thus far. So many people believe they don’t have to worry right now. “They know something’s wrong, but it hasn’t resulted in people paying more taxes,” Pinsonat explains. With five days till the election, Senator David Vitter’s campaign for governor appears to be in trouble. Four different polls in the past month show the presumed front-runner’s lead steadily eroding.